Here you go, the lion sleeps with the lamb. They all want you to NOT support Cliven Bundy because they say he’s a racist. Did they LISTEN or just cherry pick? I listened to the long version of the remarks instead of the one edited to exacerbate the situtation. Though clumsily stated, his point was one that’s been voiced by many… the black population has been disproportionately enslaved to government handouts by a “war on poverty” that has increased reliance on federal assistance in low income communities, not decreased poverty. Hey Beck… does that point sound “racist”, or just very familiar? The bill of rights is NOT limited to perfect people, it is applicable to ALL citizens. If we limit support to those without faults we are roughly 2000 yrs too late for our only shot. Heck, Al Sharpton has a glaring record of being a confirmed racist. He also owes the govt at least as much as Bundy does. But he has a primetime slot on a national news station. Have you seen footage of MSNBC surrounded by armed troops? Has a single member of Sharpton’s family been tased? Any family members thrown to the ground? Surely some of them have had an attack dog sent at ’em? Right? They very clearly violated the spirit of that law. The general idea of posse comitatus is that we don’t use the 101st Airborne in collection of library fines. Supporting a government that uses a pile driver to swat flies is a bad idea. The BLM is required by law to use local authorities in collection issues. Nowhere are they allowed to field private armies of their own making. Combating government tyranny is a helluvalot more important than a debt that is roughly 10% of the cost of 1 vacation the first lady has taken. The federal reaction was not proportionate to the cause. This was the federal equivalent of having a citizen wake up with a horse head in their bed for daring to challenge the powers that be. There is no defense for the government’s action. Sorry Beck, you are just wrong. You missed the whole darned point. 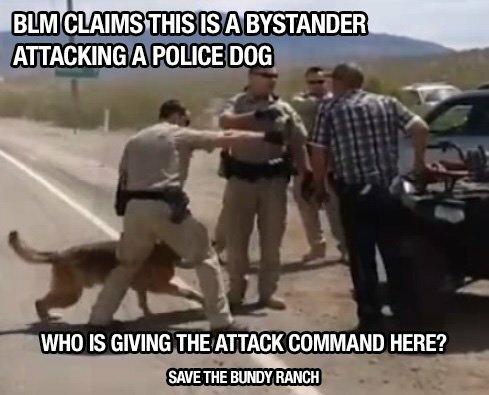 This is NOT about Bundy. This is about federal over-reach. As for Harry Reid and CNN, heck, how often are they right? Reid is so crooked that when he finally dies they won’t bury him, they’ll screw him into the ground. He’s a sad, vicious little man, and the citizens on Nevada need to recall him before he gets somebody hurt. The left has launched their best HEY LOOK SQUIRREL technique to divert attention from government over-reach to Bundy’s personality. How predictable. Sadly, many of the right have fallen for it. C’mon fellas, try to focus please. The issue is not whether Bundy is a saint, it’s about whether the government is allowed to use military might to settle relatively minor civil issues. HINT: The answer is a resounding NO. Needless to say, Bundy handed the Left a club to beat him with. His position, though technically valid, was clumsily stated. You covered this with inescapable logic, as is the usual case. Bundy is not a university professor, a journalist, or a political pundit in the first place. The man is a cattle rancher, a profession where eloquence is not high on the list of required skills. That said, we have GOT to stop shooting ourselves in the foot. These “facepalm” moments that certain of our number just cannot seem to avoid has simply got to stop. Any Conservative who has a microphone stuck in his/her face needs to slow down and think what they are saying through. Consider what your statement will sound like to those who are our political enemies. Don’t make a statement that will be used against us all, and in addition, gives the Marxist/Socialists an opportunity to dodge the spotlight. Amen, Wendell. Your post deserves re-reading, if not it’s own blog post. I am shocked by the conservative media on this whole Bundy thing. They’ve missed the whole point of everything. The first Bundy scandal had nothing to with cattle, it had to do with government is involved in every aspect of everybody’s lives, and they are complete out of control. The racial thing was just clumsily stated but the point was blacks have no jobs, it just came out the wrong way. Can’t they analyze this. What is the deal with guys like Bill O’reily and other radio and commentators. They have turned into complete idiots. They stand for nothing but the status quo. I can’t really watch these people any more. Need new media. Yep. Gets harder every day to watch major media without cringing.